Pune-based Good Juicery, a sparkling fruit juice manufacturer which launched its product six weeks ago, is all set to expand its presence across India. To start with the company will begin its expansion plan by setting up distribution channel from Mumbai followed by Goa in October 2013 and later to Bangalore and Delhi in the months to come. 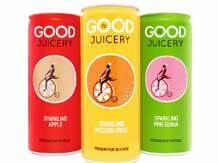 Good Juicery at present has sales of about 4,000 cans per month and is looking to double it by May 2014 in Pune. The company floated by a Cape Town native and now a localite Michelle Bauer and her food technologist friend Julia Madlener has outsourced the manufacturing to a local facility on Pune-Solapur road. The company's facility holds the capacity to scale up its production to 150,000 cans per variant per run, with potential for a further increase. The promoters have invested so far Rs 15 lakh and the duo now plan to approach potential investors for further funding. "Here we would be looking for a partner with expertise in the FMCG sector. We would be looking for an investment that would allow us to scale up our production, and increase our distribution to major cities beyond Maharashtra," said Michelle Bauer, director, The Good Juicery. Good Juicery products are currently available in three flavours-- pink guava, apple, and passion fruit containing 40 per cent fruit juice and no preservatives, artificial flavours or colours--through 25 top-end stores and hotels in Pune. The company is considering flavours like cranberry, watermelon and orange to expand its product range. To begin with, the company aims for a similar sales figure of 4,000-5,000 cans per month in Mumbai. The cost per can is Rs 75.